Christmas Gift Idea's For Kids 6 and Over. The Christmas ad's are out, the radio stations have begun playing Christmas tunes and I have spotted a few Christmas tree pictures on Facebook already, So that can only mean one thing, Christmas is well and truly on its way and I had better make a start on my Christmas shopping! I have definitely found as James has got older it has become a lot more difficult to buy for. I mean Evelyn loves so many things it has been quite easy to pick her up presents that I know she will love (if you are looking for gift ideas for kids under 6 check out our Christmas Gift Guide For Kids Under 6 here). However as James has got older he is more into computer games and things like so buying toys and games for Christmas has become increasingly tricky. I always try to include some family games in Christmas gifts as I know they will be used time and time again throughout the year. Lots of the games are either too young or a little too complicated for James however Super Ski Jump from Drumond Park caught my eye as it looks like so much fun! Steep, steeper, or steepest? 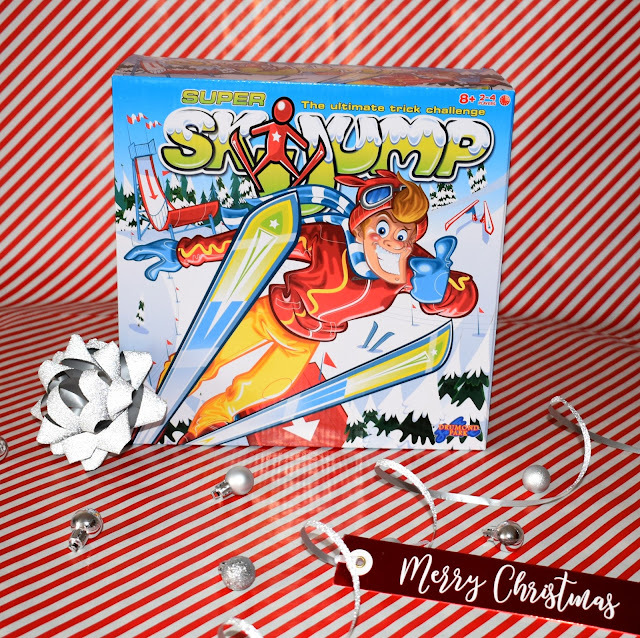 Choose your slope, then touch the button to get the jump under way! You’ll need a cool head and lightning reactions as you hit the launch zone and whack the control to make your competitor fly! How far can they swoop? Stable or somersaulting? Steady and safe, or SPLAT? It definitely sounds like it will provide lots of laughs (and comical jumps) making it a great light hearted family game. Super Ski Jump is designed for 2-4 players and aimed at children aged 8+. Who doesn't love receiving chocolate at Christmas? Well this chocolate treat has a fun twist, its shaped just like a pizza! 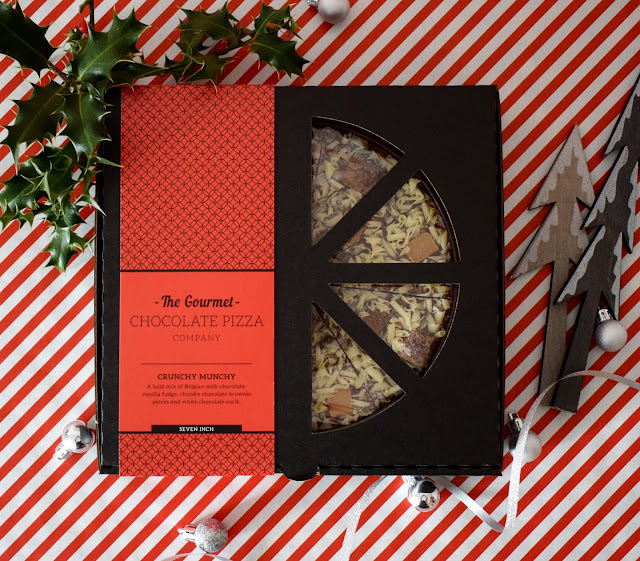 The crunchy munchy chocolate pizza made by the Gourmet Chocolate Pizza Company is a 7inch pizza made from the finest Belgian chocolate, fudge, brownie pieces and white chocolate shavings. It is pre cut into 8 slices and comes presented in a pizza box for that authentic finish. Most children will require a water bottle to take to school as well as having to hand for day trips, after school clubs etc so a fancy new water bottle can make a great Christmas gift. 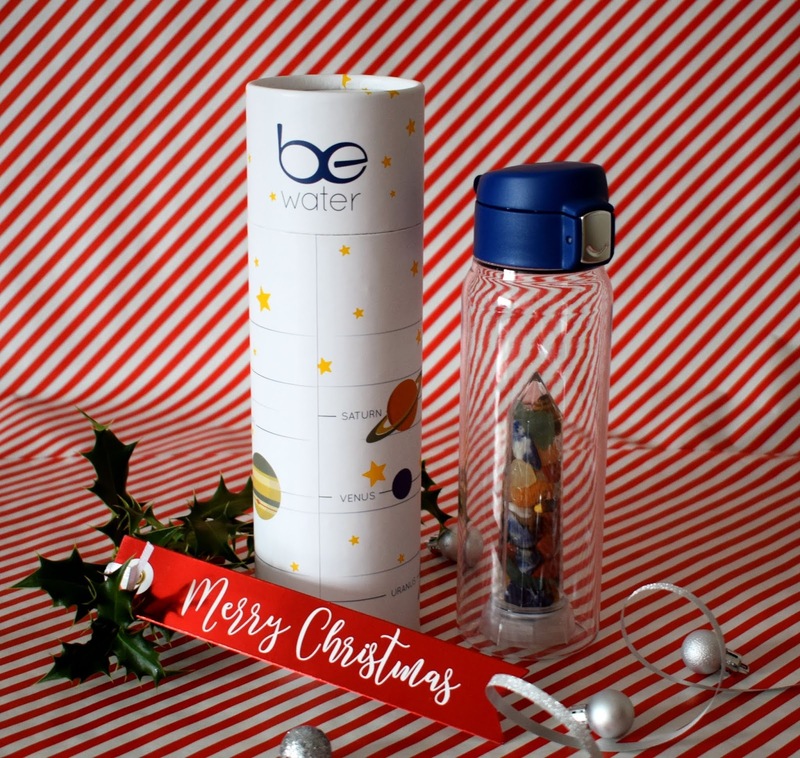 BeWater have a range of both adult and junior water bottles that have a special twist. Every bottle contains a combination of gem stones. The gemstones in BeWater bottles transfer their energy information to the water in the bottle, changing and improving the water’s structure and its oxygen and pH levels. BeWater has four ranges which are BeMagic, BeJoy, BeLove and BePower, each containing unique gems with a varity of different features. The bottle above is from the BeMagic range and contains Red Jasper, Sodalite, Tiger’s Eye, Green and Yellow Aventurine. With Red Jasper for courage, Green Aventurine for peace, Yellow Aventurine for balance, Tigers Eye for insight and Sodalite for truth. Fun, fabulous and super hydrated. The bottle is made from durable tritan plastic and measures around 22cm in height. It can hold around 440ml of liquid. As a child I have found memories of making perfume from rose petals in my nan's garden. However times have definitely moved on from gathering up petals from the ground thanks to Project Mc2. 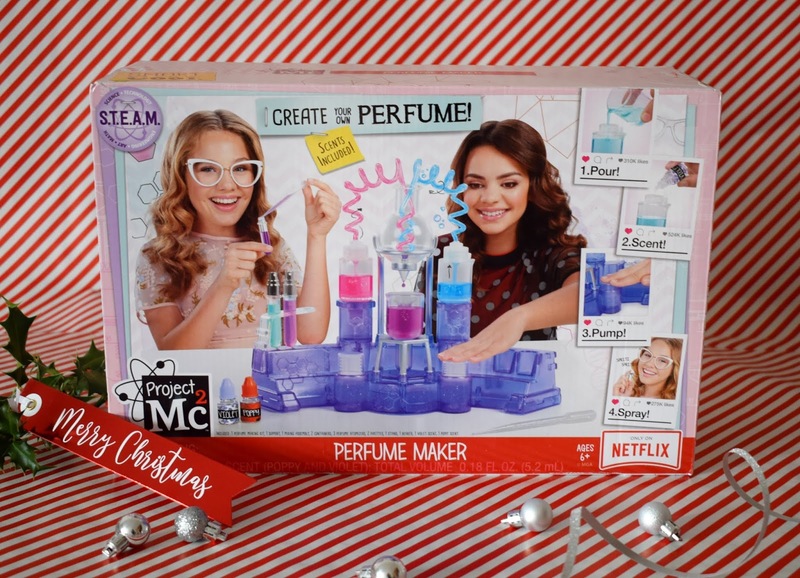 They have a fantastic range of S.T.E.A.M toys which include the perfume maker above. The Porject Mc2 is a complete set that allows you to make your very own perfume from start to finish using just this set and household ingredients. You can choose your own scents and then watch as you pump them through the clear tubes and your scent drips into the containers. The set also contains test tube style spritzers to store your new perfumes in once made. If your child loves getting creative (and loves glitter too!) 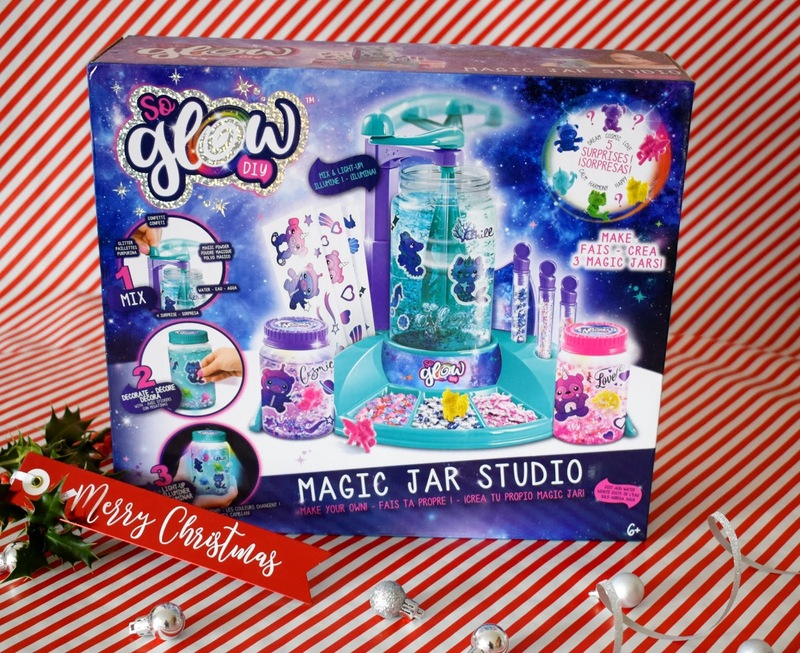 then the So Glow DIY Magic jar studio could be the perfect gift. The slow Go DIY Magic Jar Studio includes everything you need to create your very own light up jar creations! The set comes complete with everything you need to create up to three jars (one large and two mini). You will also find a whole range of glitter, confetti, stickers and 5 collectible figures that you can use in your jars. All you need to add from home is water! The kit comes complete with a stand to store everything on and is really simple to use meaning kids can independently create their own jars in just a few simple steps. Like most boys his age, if its gross or features monsters/aliens James will love it! So when I spotted these crate creatures I knew they would make a perfect stocking filler for him. The fun starts before you even release your crate create, pull his tounge to see him fly through the air and crash through his crate. Each creature will make noises as they fly through the air and when they make impact. These gross creatures will make gross noises and sounds when you pull their tounge and with 6 to collect you can create your own gross crate creature collection. Kids are fascinated by the world around them and as parents its really important we find ways to nurture that. These living world kits from Interplay are perfect for giving kids a close insight into how certain bugs and insects live as well as being a great educational tool too. 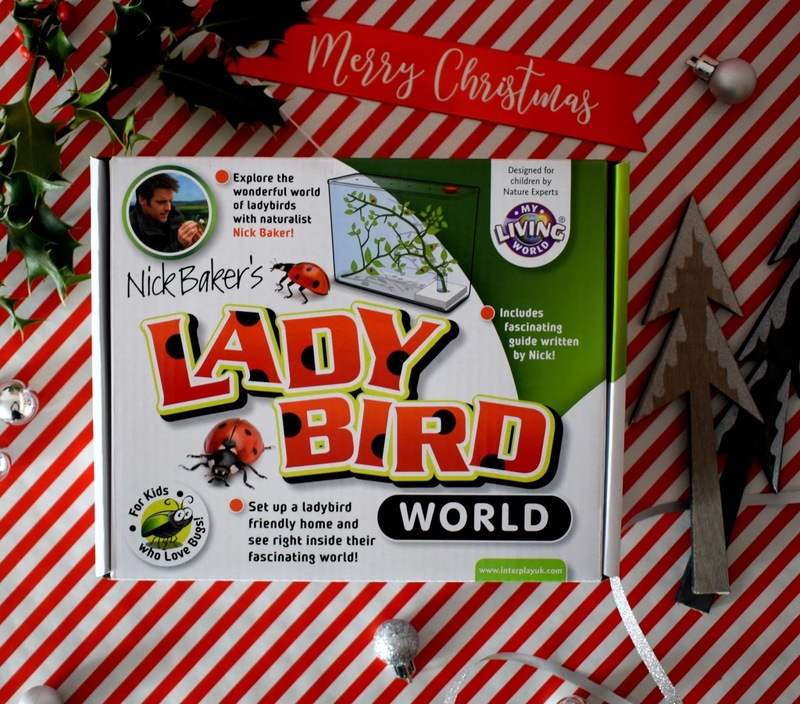 Designed with the help of Nick Baker the kit helps children to understand all about how ladybirds work and their habitat as well as teaching them how they can help care for lady birds and some really fascinating facts. This is aimed at children aged 5+ and even as an adult I found this set fascinating. What kids don't like to pretend to be spy's on a secret mission, I know mine certainly love this game anyway! 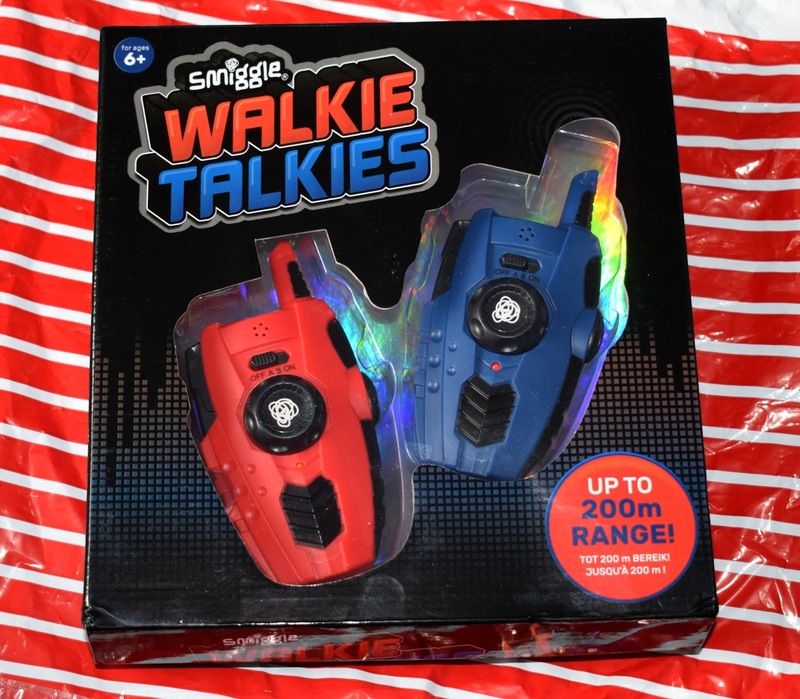 Well now it can be made even better with these fun walkie talkies from Smiggle. They come in two colour ways, the one shown above and a pink/purple colourway too. They have a range of around 200m and the sound is surprisingly clear, even from almost 200m away. The Smiggle Walkie Talkies are really easy to use even Evelyn who is 4 was able to use them with a little help so they would be perfect for kids age 6+. If you are planning on getting your child a new scooter or bike this Christmas (or perhaps they already have one from a previous Christmas/Birthday) a helmet is a must! I know that lots of kids, especially as they get older seem to think its not cool to wear a helmet but Mini Hornit are changing all that with their Mini Hornit "Lids". 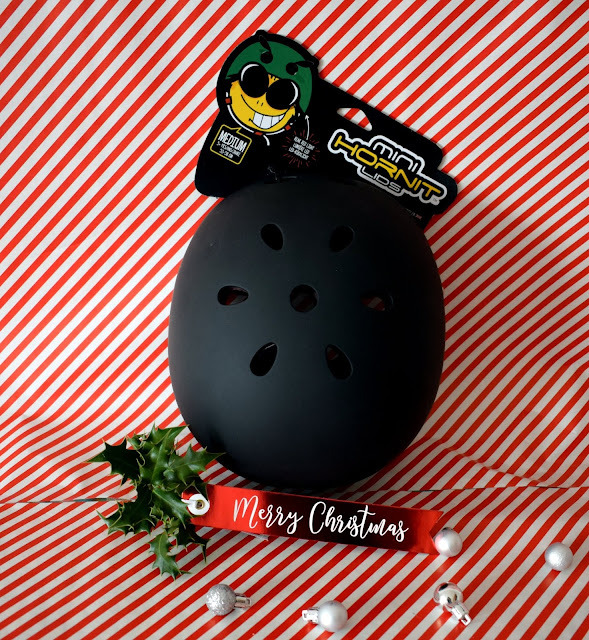 These helmets are all designed to look and feel stylish and fun (or quietly understated when it comes to stealth). Each helmet is fully adjustable, comfortable, lightweight and actually something kids will want to wear. Kids will also love the subtly integrated LED lights that feature on these helmets. Especially useful if your child rides in the dark or will be riding home from school as the light fades. 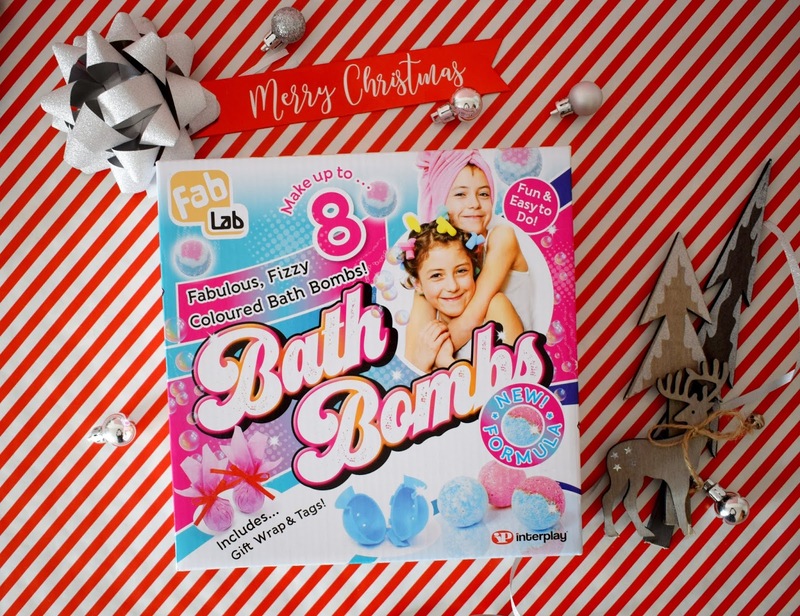 It's not just us adults who love a relaxing bath and this FabLab Bath Bomb kit from Interplay makes bath time both relaxing and fun. This kit contains enough ingredients to make up to 8 fun fizzy bath bombs just by following the simple instructions included. The Kit also contains wrapping paper, ribbons and gift tags so your children can even gift their fabulous creations (if they don't use them all themselves). We loved the kit and found it surprisingly easy to make our very own bath bombs which make the bath look and smell amazing. Due to the chemicals included in the kit this is for children aged 8+ although could probably be used by children slightly younger with some supervision. Darcy Curl is a doll with a twist, inspired by their 6 year old daughter the makers of Darcy Curl wanted to create a doll that is reflective of lots of little girls we see everyday but rarely see in toy shops we visit often. 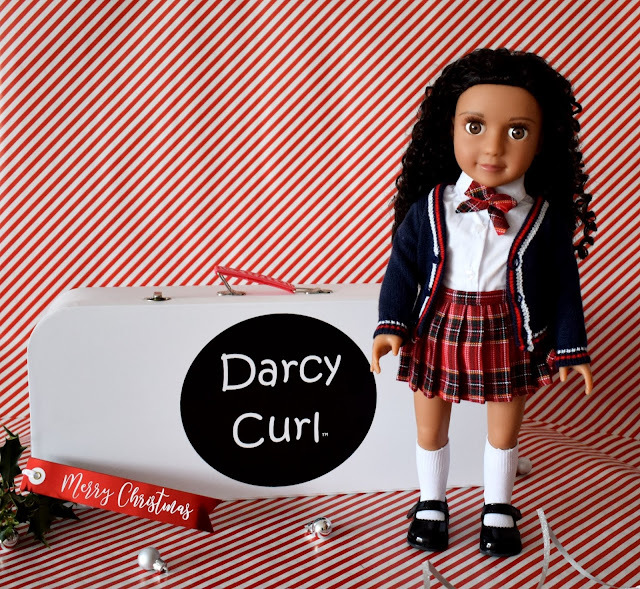 Darcy Curl is an 18inch tall mixed race doll with curly hair which is a synthetic hair which has been sourced through premium wig makers giving her hair a beautiful bouncy curl. 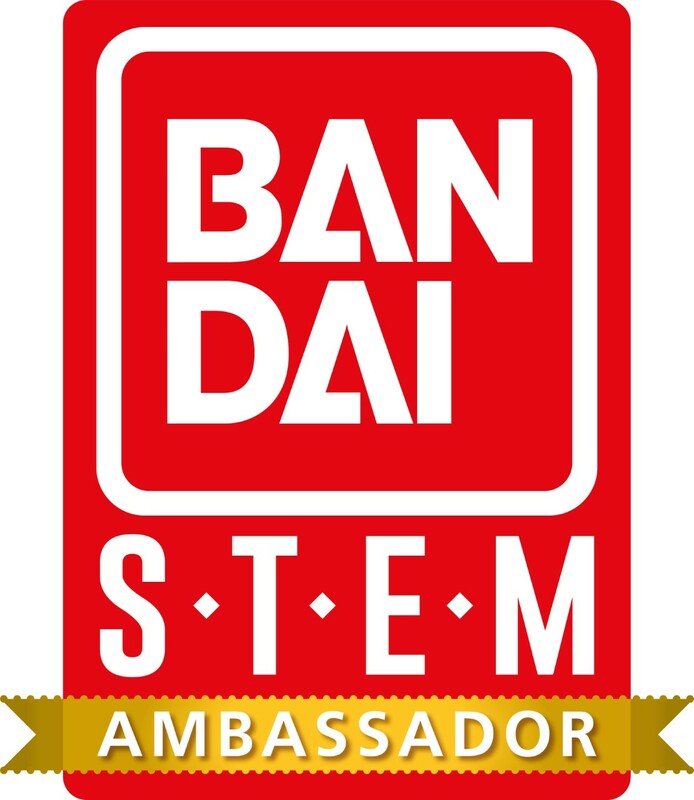 Each doll comes with a luxury school uniform outfit which if fully removable and includes a skirt, shirt with bow tie, cardigan, socks, shoes and underwear. With body and facial dimensions of an average 7 year old girl, Darcy Curl is based on an inquisitive character who likes to explore the world around her through science. 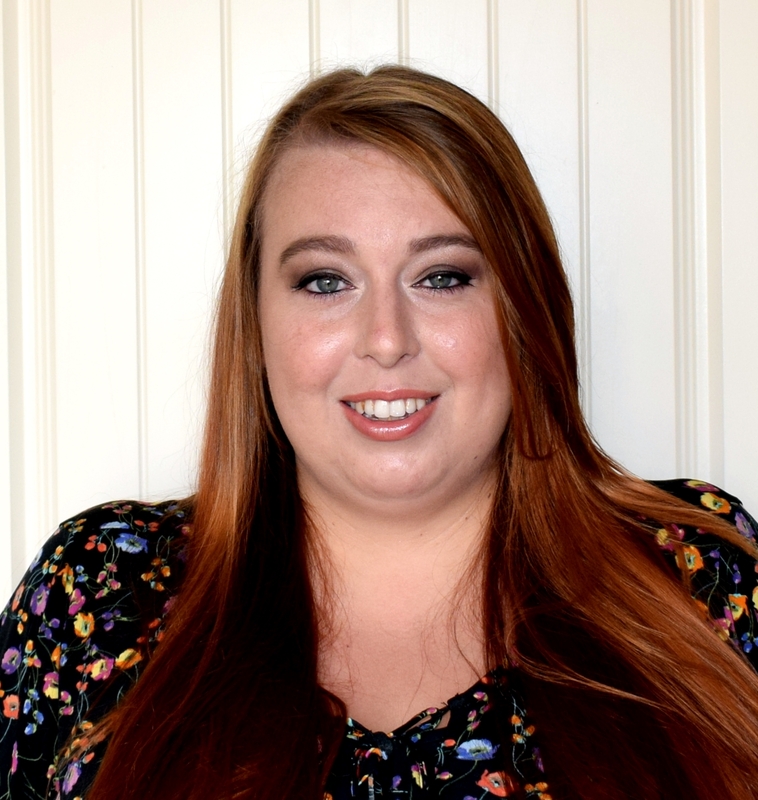 Darcy Curl is breaking down the barriers of what "normal" dolls look like and allows kids to relate to dolls that look just like them. Darcy Curl also comes with her own carry case so she can be stored away safely or be carried around with your child. Every girl needs a great bag right? Well Smiggle definitely have you covered! 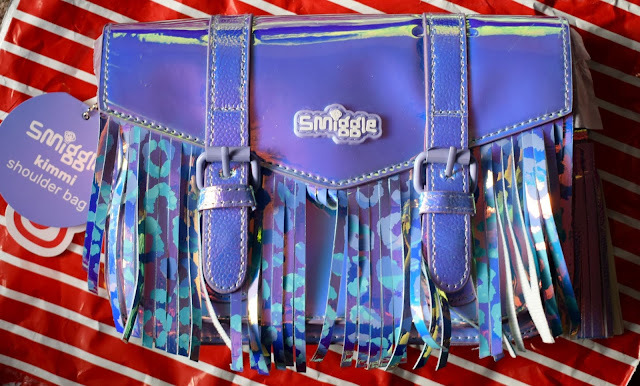 They have a fantastic range of bags from back packs to shoulder bags like the one above and all in amazing prints, colours and with all the glitter and iridescent fabric you can imagine. The Kimmi shoulder bag has a beautiful rainbow sheen and fringed front. The buckles are actually just for the look as you actually lift these to reveal a Velcro fascenting. The main compartments is pretty big for a kids back and has plenty of room to store a little purse, some hair clips and some of little trinkets. Its most definitely eye catching and super pretty. I don't know many kids who don't love slime and all things gloop. Zimpli kids most definitely have kids in mind when it comes to their products which include Slime Baff, a fun product that turns bath water into a oosy, gloopy green slime! Gelli Baff, which turns your bath water into a tub full or jelly goo which really does feel like chunks of jelly in your bath tub. Then their is SnoBall play, which brings a snow day to your house even in the height of summer! To create snow wherever you are, just add water to the powder and wait a few moments (stirring occasionally). Before your eyes you will see snow appear which can be used for snowball fights galore. The mixture looks like real snow but feels almost gloopy and is really easy to clean up too (perfect for us parents!). There are lots more products in the Zimpli range too which would all make great stocking fillers and gifts for the slime loving kids in your house. 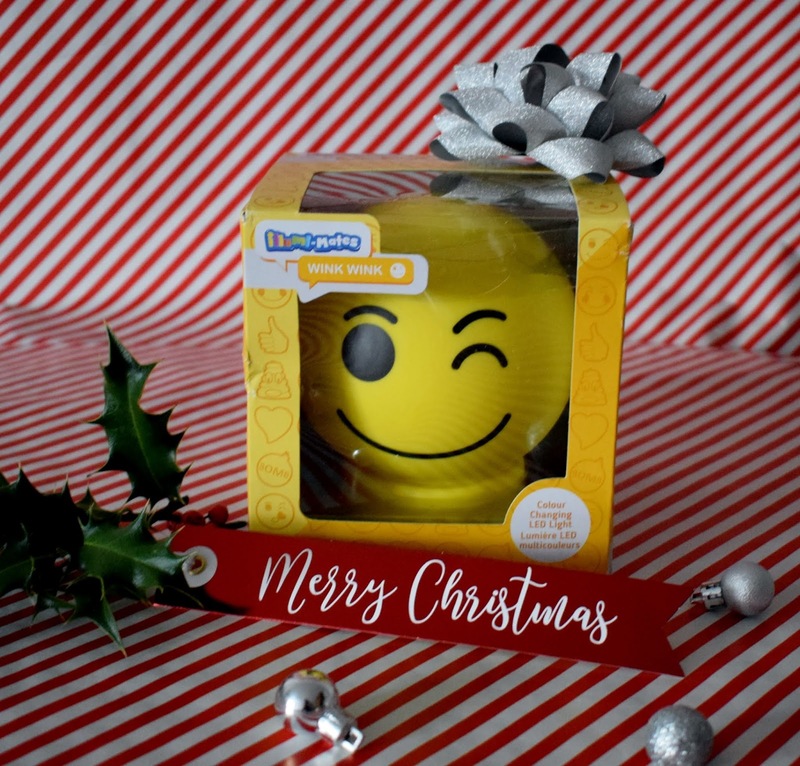 Night lights aren't just for little kids and these emoji colour changing lights from Spearmark prove just that. The illumi mates emoji range features some of the most popular emoji faces include the "wink wink" face above. The light features colour changing LED lights which glow from purple to pink to red to green, blue and back to purple again. The illumi mates lights are perfect for desks, bedtime reading and for sleepovers or camping trips. They run off batteries and stay cool to the touch when in use. Other emojis available include tears, kiss and even the poo emoji! 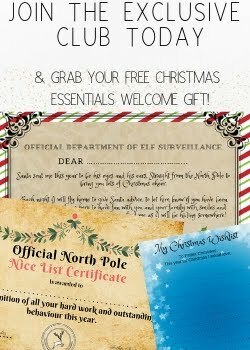 So there you have it, our gift idea's for those tricky to buy for older children. Have you spotted any gifts here you think your children would like? Some brilliant ideas here. I always get a chocolate pizza for my son who is 21 as he loves them. I think my kids would like pretty much everything on that list!! Fab ideas! I love the look of the chocolate pizza, our two favourite things together! Lots of great ideas, but my son would love the chocolate pizza!